Katmai National Park and Preserve, Alaska. 80-meter (260-foot) high Novarupta, a blocky rhyolite lava dome that marks the vent for the June 1912 eruption that created the Valley of Ten Thousand Smokes. This eruption was the most voluminous on earth in the 20th century, ejecting nearly 30 cubic kilometers (7 cubic miles) of material in 60 hours. Falling Mountain, a lava dome truncated by the 1912 eruption, is visible behind the Novarupta dome. Snow-capped Mount Mageik volcano can be seen at the top. Photo courtesy of USGS by T. Miller, June 1979. Katmai National Park and Preserve, Alaska. 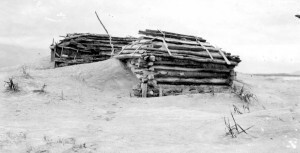 Ash drifts around houses at Katmai after the June 1912 eruption of Novarupta Volcano. August 13, 1912. Photo courtesy of USGS. The enormous explosive eruption of Novarupta, a new volcano on the Alaska Peninsula, in 1912 is exceptional for many reasons. It created the famous Valley of Ten Thousand Smokes, triggered the collapse of nearby Mount Katmai volcano, and spurred research and deliberation among practitioners of the growing science of volcanology. Two new publications are now available online to mark the centennial of Novarupta and describe the “complexities and wonders” of its 1912 eruption. Katmai National Park and Preserve, Alaska. 80-meter (260-foot)high Novarupta, a blocky rhyolite lava dome that marks the vent for the June 1912 eruption that created the Valley of Ten Thousand Smokes. 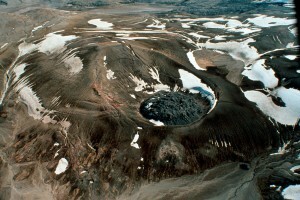 Surrounding the dome is an oval-shaped ring of coarse tephra that accumulated during the waning explosive phases of the eruption. Photo courtesy of C. Nye, Alaska Division of Geological and Geophysical Surveys, August 1991. Novarupta’s explosive eruption on June 6-9, 1912, expelled 13-14 cubic kilometers (3.1-3.4 cubic miles) of magma, the second largest in recorded history. The eruption quickly formed a massive ash column that rose more than 30 km (19 mi) high and spread as an enormous umbrella cloud 1,600 km (1,000 mi) wide. The jet stream blew the ash cloud eastward around the world, causing average temperatures in the Northern Hemisphere to drop by about 1degree Celsius (2 degrees Fahrenheit) for more than a year. During the eruption, Kodiak village, 170 km (105 mi) to the southeast, was in near total darkness for 60 hours as sulfur and ash filled the air. Lightning struck and buildings collapsed as falling ash at least 30 cm (12 in) thick smothered the village! Roughly half of the magma erupted from Novarupta spread to the northeast as far as 25 km (16 mi) in a series of extremely hot pumice-rich pyroclastic flows that filled a broad valley as deep as 100-200 m (330-660 ft). Also called ash flows, these deposits remained hot for decades, resulting in steaming cracks and fissures first seen and described by Robert Griggs in 1916 as the “Valley of Ten Thousand Smokes.” He incorrectly interpreted the fumaroles to reflect heat rising from new magma that was thought to underlie all or much of the valley. About 11 hours into the eruption, the ash column and pyroclastic flows were still going strong when the first in a series of 14 magnitude 6-7 earthquakes occurred. These earthquakes accompanied the collapse of Mount Katmai 10 km (6 mi) away! 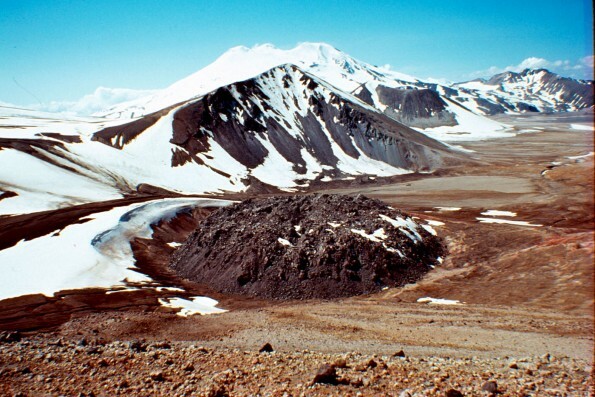 Amazingly, sufficient magma from beneath Mount Katmai had erupted at Novarupta to remove support of the cone, and the summit of Mount Katmai collapsed into the void to form a 2.5-km (1.5-mi) wide caldera. When first seen in 1916, the steaming caldera floor was about 500 m (1,640 ft) lower than the lowest part of the caldera rim. The caldera is now filled with water deeper than about 200 m (655 ft). After about 16 hours, when nearly all of the pyroclastic flows were emplaced and as Mount Katmai continued to collapse, a lull of only a few hours was followed by a second explosive phase that lasted about 29 hours. Another lull and a third shorter phase signaled the eruption’s end by early June 9. Until 1953-54, Mount Katmai was mistakenly identified as the vent for the 1912 eruption. Only detailed mapping of the two volcanoes by UC Berkeley geologist Garniss Curtis revealed that Novarupta was the real source. Curtis was the first to suggest the magmatic connection between the two volcanoes. 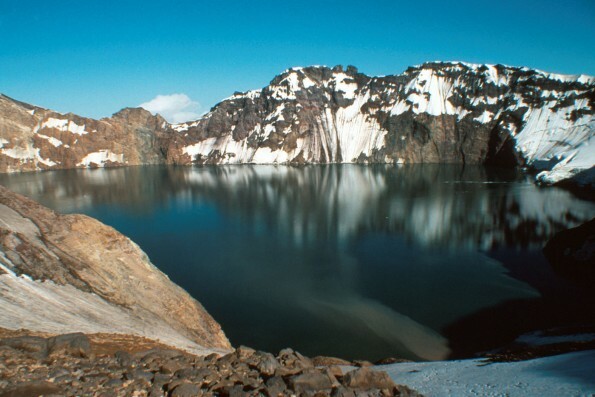 The range and timing of magma types—rhyolite, dacite, and andesite—erupted by Novarupta but residing beneath Mount Katmai, is highly unusual. That the magma types also mixed together during ascent to the surface was one of the more astounding stories of the eruption. 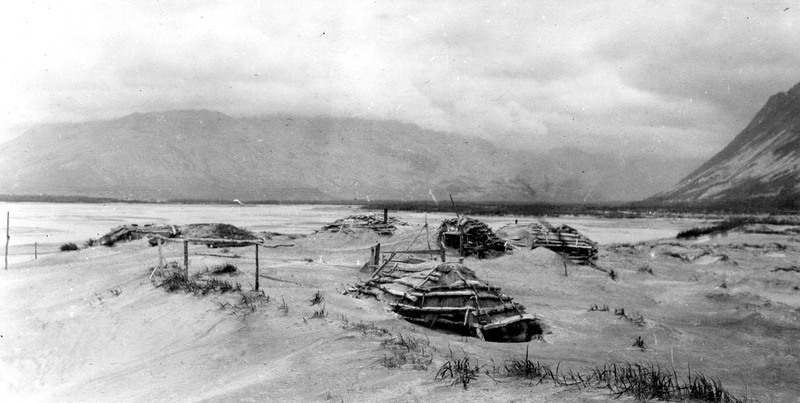 Many more exceptional observations and interpretations of Novarupta are described and richly illustrated in both centennial reports on Alaska’s great eruption of 1912. Katmai National Park and Preserve, Alaska. View from the west rim of Katmai Caldera, a collapse feature that formed during the catastrophic eruption of nearby Novarupta Volcano in June 1912, is a steep-walled, 1.5-kilometer (1 mile) diameter crater which truncates a formerly 2,290-meter (7,513-foot) high stratovolcano. The caldera is partially filled by a blue-green lake about 250 meters (820 feet) deep. The lake level was still rising when last measured in the mid-1970's. The east interior wall of the caldera is visible. Photo by R. McGimsey, July 16, 1990.